Washington State University has been involved with organic agriculture for decades. Organic agricultural research started at WSU in the 1970’s and an organic major was introduced for undergraduate students in 2006. In 2007, WSU purchased a new research farm with over 100 acres of certified organic production already in place. Orchardists worldwide are increasing their use of organic and sustainable production systems due to consumer preferences and land and environmental stewardship priorities. Organic tree fruit production has provided a valuable commodity for growers in the state of Washington for over a decade. Numerous resources on organic production can be found on this page including: current research; certification; orchard establishment; insect pest management; disease management; tree fruit nutrition; weed control; tree training systems; packing and storage; vertebrate pest management; and food safety. The state of Washington passed the Organic Food Products Act in 1985 and created a certification program managed by the Washington State Department of Agriculture (WSDA) in 1987. In 1990, the federal Organic Foods Production Act was passed to develop a national system to standardize organic certification among states and private groups. The ‘National Organic Standards’ was released in 2000. The National Organic Program (NOP), based in the Agricultural Marketing Service of the USDA develops standards that maintain the integrity of the organic process (from seed to table) to ensure that consumers are purchasing a bona fide organic product. Certified organic products can be labeled with the federal USDA organic seal, or that of the certifier such as the state agency, WSDA. WSDA must comply with the national standards and receive accreditation from the USDA to act as a certifying body. WSDA Organic Food Program staff can help you evaluate organic certification and what it might take for your farm to comply. You can find a program handbook, list of certifying agents, and how to get your farm certified here. Certified organic fruit are produced, packed, and stored using approved practices that promote sustainable balance in the ecosystem by protecting resources and the environment while producing healthy trees and quality fruit. Organic tree fruit production and sales continue to grow locally and nationally with Washington state being the lead producer of organic apples, pears, and cherries. (See Recent Trends in Certified Organic Tree Fruit, (pdf presentation), and more recent updates here, (Organic statistics, WSU-CSANR webpage). Tree Fruit growers are choosing organic methods for many reasons today: Profitability, traceability, accountability, resource conservation, and worker and food safety. There is better knowledge about agricultural ecosystems, and the benefits of protecting natural enemies, and farmland today. Managing for better soil conditions and for increased biodiversity are two cornerstone principles of organic production. Some orchard management practices that are effective for organic orchards are used in conventional growing operations as well. Integrated pest management (IPM) practices, pheromone mating disruption, and the emphasis on biological control are successful orchard management strategies that are similar for organic and conventional growers. The availability of new, natural products such as spinosins, codling moth granulosis virus, yeast formulations for fire blight control, and approved, effective materials for thinning apples are other management tools useful to both organic and conventional growers. Several challenges face organic tree fruit growers. One challenge is weed management since the weed management tools available are not as effective as those available to conventional growers (e.g., synthetic herbicides), and they are usually more labor intensive. Soil fertility management is also challenging and is dependent on organic amendments only. Ensuring accurate nutrient application timing and amount delivered is often harder to predict and control and ultimately match with tree needs. Rodent control is based mostly on trapping and encouraging natural predators in orchards. Certain tree fruit pests like pear psylla, and spotted wing drosophila in sweet cherries, and diseases like powdery mildew and scab on apple, and fire blight in apple and pear can also be challenging to manage and control in organic programs. Organic growers are required to create an organic system plan that describes the methods and timing of treatments that will be used in their farm management. Accurate records and documentation of all practices and materials used are needed, as well as annual inspections of farms and facilities. The packing warehouses, processing plants, or wholesale buyers need to be certified to handle organic products. Methods used in organic production are generally determined by the organic certification standards. Most ‘natural’ methods and products are allowed, although the USDA keeps a list of natural materials that are not permitted. Synthetic materials are not permitted, unless specifically approved by the National Organic Standards Board. These materials are reviewed every five years, and growers need to provide their input during the national review process if they want these products to be allowed for use in the future. We’ve put together additional information on specific topics related to organic orchard production. Click on the title headings below to view the related information. Replant disease often occurs in tree fruit (apples, pears, cherries) blocks that were previously planted with tree fruit. On such sites, new trees often don’t grow as well as trees planted into soil with no history of past tree fruit production. This is due to a combination of soil microorganisms that are prevalent near the tree roots (fungi, nematodes, etc.). Soil fumigation to control replant disease is used in conventional orchards, but is not allowed in organic production. M. Mazzola, a USDA-ARS research scientist, has been conducting research on biological alternatives for replant disease control. Pre-plant treatments of seed meals in the mustard family have been effective. Seed meal is what remains after the oil has been extracted from the seeds. One approach to deal with replant disease is to use fumigation and designate the block as conventional then immediately transition to organic. By the third year the block should qualify as organic (see Good Fruit Grower article below). Brassica seed meal soil amendments transform the Rhizosphere Microbiome and improve apple production through resistance to pathogen reinfestation, M. Mazzola et. al., Phytopathology, 105(4), pp. 460-469, April, 2015. Advances in Brassicaceae seed meal formulation and application protocol for control of apple replant disease, M. Mazzola, USDA-ARS, poster, WSHA annual meeting, 2010. Managing the Microherd for Maximum Tree Performance, M. Mazzola, (Video), USDA-ARS, during the “Roots: Foundation of your orchard” series, 2014. A common sense organic approach, G. Warner, Good Fruit Grower, January, 2014. Insect pest management strategies are limited due to the restrictions on use of synthetic controls. Many pest management technologies are useful for both organic and conventional growers (IPM, pheromone mating disruption, biological control, decision support tools such as WSU-DAS). New pests though, could cause some problems for organic production (e.g., spotted-wing drosophila and brown marmorated stinkbug). Growers must check that all products used are in compliance for certified organic production, as well as approved by the EPA and WSDA. Mating disruption for codling moth, used with other strategies, is a core pest management practice. Dormant oils and kaolin clay can be used for control of pear psylla and other insect pests. Monitoring, trapping, and using decision support tools (e.g., WSU-DAS), all help to determine pest abundance and the need and timing for optimal control. While utilizing organic practices, some growers do experience increased biocontrol of certain pests over time. WSU-DAS, includes organic management options. WSU Crop Protection Guide, includes organic materials. Spotted Wing Drosophila control on sweet cherry, recommendations for Eastern WA, 2014. Includes organic methods. Cherry Fruit Fly control, Chelan-Douglas Co. Extn. page, includes organic methods. (Accessed: 1/19/17). Cherry Fruit Fly bait, Chelan-Douglas Co. Extn. page. (Accessed: 1/19/17). Stinkbug challenges organic growers, R. Lehnert, Good Fruit Grower, March, 2015. Apple Scab is probably the most challenging disease to control for organic producers, mostly in more humid climates than central Washington. Mildew can also be a problem and there are organic compliant materials available to treat this disease. Cultural practices such as pruning (e.g., dormant and summer) to facilitate good sunlight penetration in the canopy and improve air movement plus proper fertility to manage tree vigor can all contribute to disease suppression or prevention. Sanitation practices such as pruning out diseased tissue and cankers and destroying contaminated debris is necessary to eliminate inoculum and reduce disease pressure in the orchard. Organic fruit cannot be treated with postharvest chemicals like most conventional fruit and they must be kept separate from conventional fruit during storage. Packing lines must be fully cleaned prior to running organic fruit to avoid contamination. Fire Blight Control in Organic Apples and Pears, WSU-TFREC page. Fire Blight Control without Antibiotics, G. Warner, Good Fruit Grower, March, 2014. Non-Antibiotic Control of Fire Blight in Organic Orchards, K. Johnson, Oregon State University, pdf presentation, 2014. Controlling Mildew in Organic Cherries, M. Hansen, Good Fruit Grower, February, 2010. There are numerous options to control weeds including flaming, mechanical tillage, the use of ground covers, mulches and weed fabrics, mowing, and hand-pulling, however, synthetic herbicides cannot be used. A few organic compliant herbicides are available that are non-selective and generally of marginal effectiveness and high cost. These various weed control practices have their trade-offs: tillage is inexpensive and effective for weed control, but it can decrease soil organic matter and prune tree feeder roots. These fine roots that are shallow in the soil profile are necessary for water and nutrient uptake. Ground covers may improve soil quality, water infiltration and fix nitrogen but they can also compete with trees and create rodent pest habitat. For newly planted orchards, the first two years are critical for tree growth and minimizing competition with weeds is important so that trees will grow quickly to fill in their allotted space in the tree row. Weed control is most critical during spring through early summer. A number of university research studies have been conducted at WSU, UC-Davis, Michigan State, and Cornell looking at different orchard floor management practices that could provide weed control in an organic system. 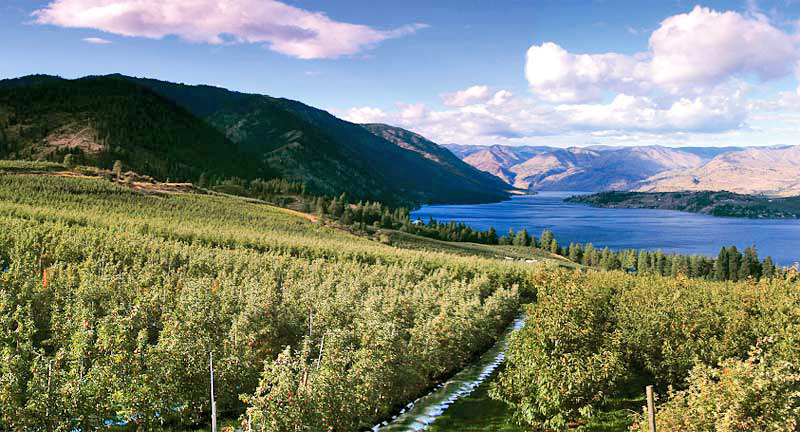 Weed Control in Orchards, D. Grantastein, video presentation, Lake Chelan Hort. Day, January, 2015. Productivity, Economics, and Fruit and Soil Quality of Weed Management Systems in Commercial Organic Orchards in Washington State, USA, D. Granatstein, et. al., Organic Agriculture, 4(3), p.197-207, 2014. Orchard Floor Management, WSU Organic and Integrated production Resource link page. Weed Management in Organic Orchards, University of California IPM webpage. (Accessed: 1/19/17). Organic certification requires a system that will “maintain or improve soil quality.” Addition of organic amendments such as manures, composts, or cover crops is one strategy that can add organic matter and supply nutrients. Other materials such as feathermeal or bloodmeal for nitrogen, or rock phosphate for phosphorus, can target a specific nutrient need. Finding nitrogen sources that release the desired amount of N during the appropriate time can be a challenge, with the material continuing to release N into harvest and beyond, potentially affecting fruit quality and tree dormancy. Growers can also use organic compliant foliar sprays, such as fish emulsion, as part of a nutrition program, and there are some liquid products that are available for applying through a drip system for fertigation. Direct-seeding Legumes into orchard alleys for Nitrogen production, D. Granatstein, et al., WSHA poster, 2012. Organic growers have more limited choices for crop load management. Organic approved bloom thinners include: lime sulfur, superior oil, stylet oil and fish oils. Currently, there are no organic products for post-bloom thinning. Fortunately, extensive research by the WA Tree Fruit Research Commission found that lime sulfur plus oil (an organic compliant thinning spray pioneered by organic growers) worked as well or better than other organic chemical thinners. Development of pollen tube growth models will help growers be more effective with this bloom thinning approach. Pollen Tube Growth Model, YouTube video, (Instructions on how to create account and set up first block in the apple Pollen Tube Growth Model), WSU Ag. Weather Net webpage. Taking the Guesswork out of thinning, G. Warner, Good Fruit Grower, March, 2015. Careful attention must be given to cleaning packing lines with approved soaps, and running organic fruit only, or organic fruit before conventionally grown fruit. Organic fruit must be stored in rooms separate from conventional fruit, and kept separate during all handling, and shipping. Handling Organic Fruit, WSU-TFREC Postharvest Information Network article. Organic orchards provide an excellent habitat for many vertebrate pests such as rodents, birds and deer. Trapping, enticing predators such as owls and kestrels with nesting boxes, and tree guards are used in rodent management. Many bird control strategies (e.g., electronic distress calls, exclusion with nets, etc.) would be similar to what conventional growers might use. Sturdy fencing and even electrified fences have been used to exclude deer. Cover crops influence meadow vole presence in organic orchards, M. Wiman, et. al., HortTech 19(3):558-562, 2009. Getting help with killing rodents, P. Rusnak, Growing Produce, June, 2013. When planting an orchard as organic from the start, treated wood posts (e.g. CCA preservative) for support are not allowed. Steel, untreated wood, or concrete are allowed. Growers with both organic and conventional production blocks should consider separate sprayers for the organic blocks to avoid potential cross-contamination. Field workers and tractor drivers should be trained to be aware of organic blocks and to double-check a management action (e.g., particularly a pest treatment or nutrient addition) that could jeopardize organic status. Also, make sure fertigation systems are carefully managed to avoid accidental application of a prohibited substance to organic trees. Organic Transition – A business planner for farmers, ranchers and food entrepreneurs, G. DiGiacoma, R.P. King and D. Nordquist. SARE Handbook. 2015 (Accessed: 1/19/17). Recent Trends in Certified Organic Tree Fruit, E. Kirby and D. Granatstein, WSU-CSANR, pdf presentation, 2014. Current Status of Certified Organic Agriculture in Washington State: 2014, E. Kirby and D. Granatstein, WSU-CSANR, pdf presentation, 2015. Status of Organic Tree Fruit in Washington State, E. Kirby and D. Granatstein, WSU Extension EM046E, 2012. Organic & Integrated Tree Fruit Production page, D. Granatstein, WSU-CSANR. Proceedings of the 2nd International Organic Fruit Symposium, D. Granastein et al., Acta Hort. v1001, Int. Soc. Hort. Sci. 2013. WSU Resources for Orchard Floor Management, Organic & Integrated Tree Fruit Production webpage. WSDA Organic Program Guide to International Organic Markets, pdf. (Accessed: 1/19/17). A Grower’s Guide to Organic Apples, New York State IPM Publication #223. (Accessed: 1/19/17). WSDA Organic Food Program (Accessed: 1/19/17). WSDA Organic Producers (Accessed: 1/19/17). USDA National Organic Program (Accessed: 1/19/17). USDA National Organic Program Handbook (Accessed: 1/19/17). Federal Regulations for the National Organic Program (Accessed: 1/19/17). Organic Materials Review Institute (Accessed: 1/19/17). Farmers’ Guide to Organic Contracts, A. Heyman, eXtension, webpage, 2013. (Accessed: 1/19/17).